Jane Koerner is a contributor to Writers on the Range, the opinion service of High Country News. The University of Oklahoma Press recently published her memoir, Off Trail: Finding My Way Home in the Colorado Rockies, under a new pen name, Jane Parnell. She was standing in the check-out line, waiting to pay for her groceries. I noticed her right away because of her long black hair, which was pulled back with a beaded leather cord, and her clothes. She wore an embroidered white cotton blouse and matching ankle-length skirt and sandals. Her frail frame suggested a childhood of deprivation. She never took her eyes off the baby in her cart, which contained bread and baby food and diapers, luxuries for anyone unaccustomed to nutritious food, clean drinking water and law-abiding police. Suddenly, from the back of the line, a tall man, the tallest in sight, shouted, “Get out! Get out! You people don’t belong here.” He strode towards her, shaking his raised milk container at her. She shrank as the giant approached, while everyone within earshot looked away or pulled out their wallets in anticipation of their turn at the cash register. Years later, I still remember the expression on her face as she hugged the baby to her chest and fled the store. “You people,” he had said, categorizing her as an outsider. In his mind she was probably an illegal immigrant and therefore a criminal. I guessed she was El Salvadoran, a relative perhaps of the family whose restaurant I’d frequented since it opened. Usually, I ordered one of their pupusas, a thick tortilla stuffed with cheese and a spicy meat or beans. Why didn’t the sight of the baby give him pause? He wore a wedding ring and was old enough to be a grandfather. An abandoned grocery cart implicated all onlookers — including me — in a conspiracy of silence and averted eyes. I paid my bill, grabbed my grocery bag and ran, hoping to find her outside. I wanted to offer an apology, give her my groceries to replace the ones she'd left behind — anything to lessen the sting of her public shaming and my complicity as a witness too stunned to come to her defense. 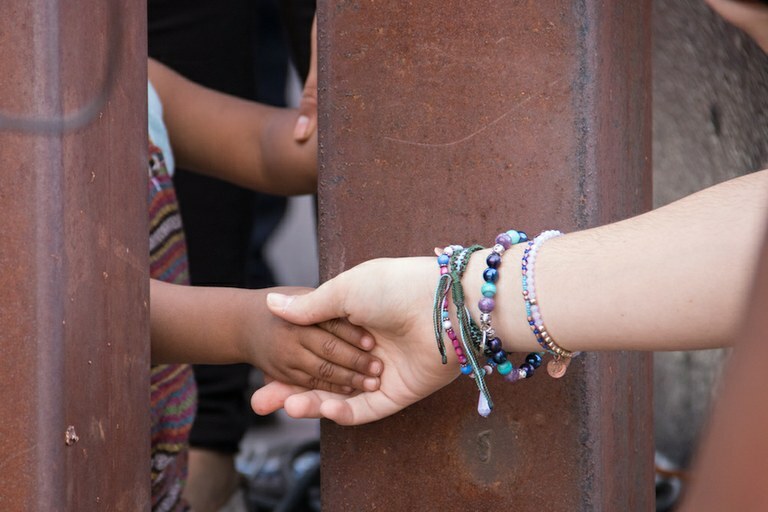 People on either side of the U.S.-Mexico border wall in Nogales, Arizona, grasp hands. She was nowhere in sight. Perhaps the hazards of daily life in El Salvador and of her journey to the United States had taught her an essential survival skill: invisibility. In the 1980s, a civil war broke out in El Salvador over the human rights abuses of the American-backed military juntas. Death squads kept the aspirations of impoverished farmers and workers in check. Seventy-five thousand civilians died in that war, and a third of the population fled. The earthquakes of 2001, and subsequent drought and famine, spurred more departures. In the 1990s, El Salvadoran gang members expelled from this country preyed on youth in their home towns, especially Americanized “outsiders.” The violence set off another wave of migration — minors fleeing for their lives and a better life. El Salvador now has one of the highest homicide rates in the world. I forgot all about the incident at the grocery store until recently, when the Trump administration revoked the temporary protected status granted to 200,000 El Salvadorans in the United States after the 2001 earthquakes. This federal designation, dating to the George H. Bush administration, shields refugees of natural disasters and civil unrest from deportation. Since the 2001 earthquakes, every administration, Republican and Democrat alike, has extended it for El Salvadorans covered by the initial decision. Then came President Donald Trump’s reversal of decades of immigration policy. Haitians and Nicaraguans who qualified for the status lost their protection, too. For more than 25 years, El Salvadorans with temporary protected status have lived and worked here legally. They own homes and pay taxes and have borne children, an estimated 190,000, who are American citizens. Some have American spouses. The deadline for settling their affairs and leaving is Sept. 9, 2019. Rather than risk the violence and unfamiliarity of a country they no longer know, or fracturing their families, many may choose to stay. They may try to disappear into the underground economy of the undocumented, with its ICE raids and lack of basic workers’ — and human — rights. I have no idea what happened to the woman who fled the grocery store years ago, or whether she still lives in the United States. I moved to another state seven years ago. I think of the baby, 12 years old by now, an American on the brink of exile, and a mother’s agonizing choice. And the choices we will face as voters in 2018. What kind of immigration policies do we want?